A view in ink of St Mary's church in Weymouth, Dorset. Construction began in 1603, when the people of Melcombe (now the Old Town of Weymouth) where authorised to build a new church on the site of an older chapel, the waste ground to north and south being enclosed to form a churchyard. This church was concecrated in September 1606 and was regularly attended by George III and his family around the time Grimm made this drawing. 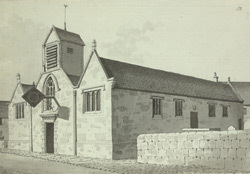 This church was demolished in 1815 to make way for the present, much larger church.